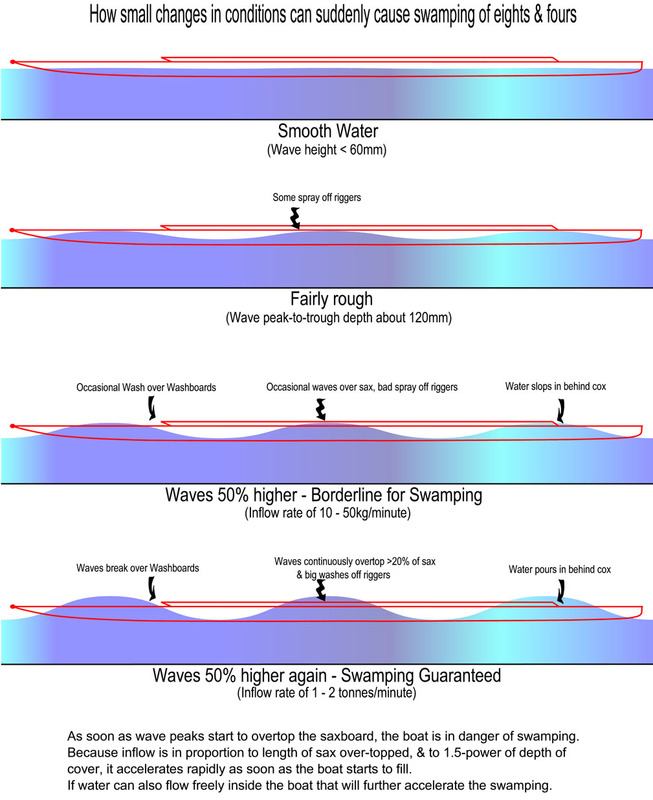 As long as they're in one piece, eights and fours don't actually sink, they just float a little under the surface. So why do I need underseat buoyancy compartments? It's true that, if intact, boats don't sink. In fact they normally provide enough buoyancy for the crew to hang on to the shell and wait for help to come. But at the same time it's an undeniable fact that being sat in the boat is a lot safer than being up to your neck in cold, maybe turbulent water, trying to hang on to a submerged boat. If you're still in the boat, you can, in the vast majority of situations, row out of danger. But if your boat doesn't have buoyancy compartments under the seats, once it starts filling with water it's not going to support your weight any more and you have no choice but to get out the boat and in to the water. If it does have buoyancy compartments then you'll be able to stay sitting in the boat even when it's full of water. So your feet may get a little wet, but most of your body is out of the water and you are at a far lower risk of hypothermia. Also, if the underseat compartments are sufficient for the weight of the crew, the boat will still be rowable. The riggers may be in the water, and it might not be easy, but it will still be possible to move the boat and control the direction it's going in. This means you can row to safety. Keeping rowers safe is the sole aim of this campaign. But what could happen to me if I was to end up in the water, trying to hang on to a submerged shell? 'ATYPICAL' DROWNING. This accounts for 10 - 20% of all cases of drowning, and can be almost instantaneous on hitting the water. This is more likely to happen when the water is entered feet first (like when a rower gets out of a sinking boat), and when the victim is in a state of surprise or unpreparedness (like when your boat suddenly sinks below you). You go unconscious very quickly (so you can't hold onto the boat), and an unconscious person sinks like a stone. When you go under a disturbed water surface you go out of sight very quickly, so can't be retrieved. The mechanism is reflex laryngospasm leading to asphyxia. There is little or no inhalation of immersion fluid. The cause is thought to be cold water hitting the back of the throat, causing a reflex closing of the airway. DROWNING. When a person goes under water due to exhaustion and/or hypothermia initially the breathing automatically stops (diving reflex), until the carbon dioxide builds up enough to produce an involuntary gasp. Water floods the lungs, there is vomiting and inhalation of gastric contents, heart rhythm disruption and lack of oxygen to the brain. Unconsciousness follows and the person sinks to the bottom. HYPOTHERMIA. This is more common in those with a high surface area to body weight ratio, such as children, coxes, or lightweight rowers. Even brief local cooling below 12 degrees C of limbs (e.g. when a warm, vasodilated, exercised rower is suddenly immersed in water) causes a motor and sensory paralysis (so you can't swim or hold onto the boat). Mental slowing, confusion and amnesia occur relatively early (so the immersed rower will not then behave rationally, or remember their ARA education). Circulatory, respiratory, renal, metabolic, gastro-intestinal, and blood system disruptions follow. The death rate from hypothermia is 20 - 80 % according to age, health status, degree of cooling, and the quality and timing of treatment received. How much extra buoyancy will I get by enclosing the spaces under the slide bed? 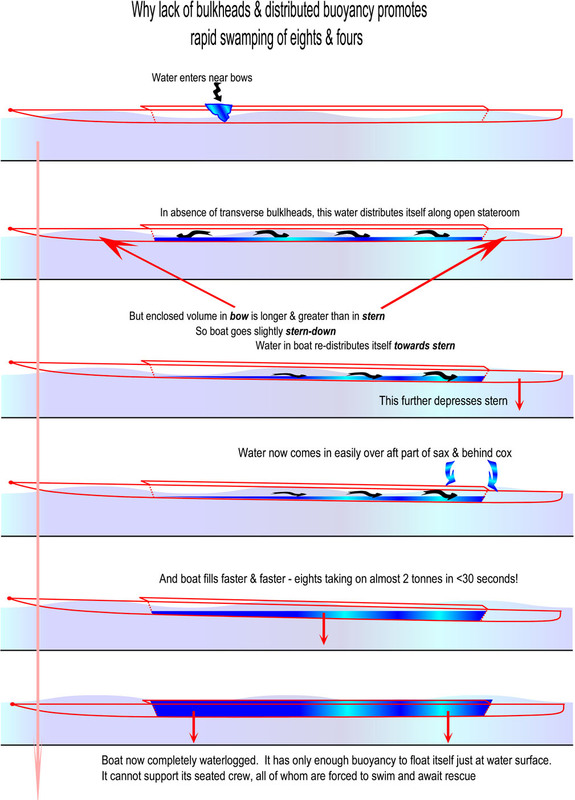 This document was circulated to NGBs in 2004 explaining the method of testing whether boats meet the FISA buoyancy standard. Taking measurements at bow and stern is to ensure level trim in a swamped boat.